The Des Moines Register has discovered that Iowa suspended its egg facility inspections last year in the wake of the bird flu. Public health officials feared that inspectors could spread the virus as they traveled between egg facilities. The pathogenic outbreak that killed millions of birds nationwide started in December 2014. The height of the epidemic occurred in early spring 2015. This action is concerning for two reasons. One is that a Salmonella outbreak in Ohio at Lucky’s Taproom and Eatery, that has sickened at least 80 people, is associated with shell eggs produced at Kenneth Miller Farms that are now being recalled for Salmonella contamination. Mayonnaise, made with eggs, at Lucky’s Taproom tested positive for Salmonella contamination during the outbreak investigation. The other is that Iowa egg producers were at the center of a huge Salmonella outbreak in 2010 that sickened at least 1,600 people. Regulations for inspections of these facilities were put into place after that outbreak. Farmers are still supposed to follow egg safety regulations, but reports of some inspections conducted before the government stopped them are concerning. For instance, amphibians such as frogs and toads, which can carry Salmonella, were found inside poultry houses. Other facilities did not wash or store their eggs at proper temperatures to prevent bacterial growth. Rodent infestation was discovered in at least 14 facilities, and at least 14 farms did not test for Salmonella as they are required to. The FDA suspended egg inspections for some facilities in May 2015 during the height of the bird flu outbreak. And other states followed suit, but resumed their inspections when the bird flu outbreak eased. In Iowa, the last case of bird flu was reported in June 2015. Iowa officials say they will resume inspections when the FDA does. 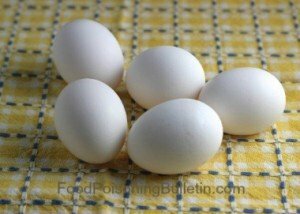 In the meantime, you can protect yourself against illness from shell eggs, especially if you are in a high risk group. Always cook shell eggs and recipes that contain them to a minimum temperature of 160°F to kill bacteria. Never eat undercooked or raw eggs. And avoid cross-contamination between raw shell eggs and foods that will be eaten uncooked. The symptoms of a Salmonella infection, the type of illness most commonly associated with shell eggs, include nausea, vomiting, abdominal pain, diarrhea that may be bloody, fever, chills, headache, and muscle pains. Symptoms usually begin six to seventy-two hours after exposure to the bacteria. Some people recover on their own after about a week, but others become so ill they need to be hospitalized. In the outbreak at Lucky’s Taproom, five people have been hospitalized as a result of their infections.